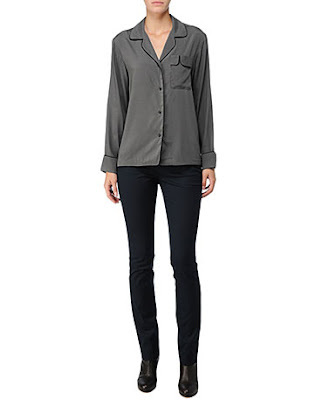 Rag & Bone's silk pj blouse is meant to be worn as a daytime look and retails for $325. If you want to try this look, why not get one of J Crew's vintage pajama sets? You can wear them as intended, or you can try out the pj top as blouse look aka Rag & Bone for less. This set retails for $78 and also comes in a light blue, click on the photo below for more information.